There is a popular book out, in which the author maintains that we have it all wrong when we approach eating healthy based on nutrition. Nutrients! Who needs them? The answer is, we do!! 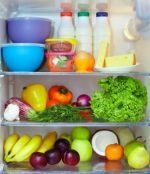 What we need to know about these important substances is probably debatable, but whoever says, “ignorance is bliss,” when it comes to nutrition, will probably spend a lot of time not feeling well. The study of nutrition is about just that—feeling well, so that you have the energy and vitality to enjoy your life. The truism that “Health is Wealth” cannot be overstated. Health is one of those things that if you have it, you can focus on other things, and if you don’t, it will be all that you can focus on. And wellness does not come about by accident. It is a conscious, purposeful approach to living that requires at least a little knowledge about nutrition. Here is an overview of healthy eating nutrition that will help you understand the basics. For more information, click on the links for each nutrient. Nutrition is a science. 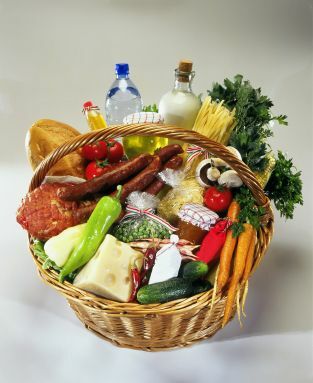 It is the study of the substances found in food and how they work in the body. Since it is a science, its findings should be based on reproducible experimentation and carefully controlled studies. Research in the relatively new field of nutrition, is ongoing and nearly every week, a new study comes out revealing some interpretation of recent scientific data. Unfortunately for us, the average people, these studies can be confusing and contradictory, especially over the long haul. If you have paid attention to nutrition over the last 30 years, you will know that many of the recommendations have changed, partly due to new and better scientific techniques, but also due to what may have been bad science. Another culprit in the confusion is the way in which the results of studies have been reported in the media. A perfectly good scientist may conduct a perfectly good study, and publish it for his colleagues in a nutrition or medical journal. The study is picked up by a journalist who may or may not report about it in a way that the scientist would have approved. Thus, there is often a disconnect between the scientific community and the journalistic community that can create confusion for the consumer. Unfortunately, there can even be a rather sinister component to nutrition research. If a certain company or food lobby has a particular interest in promoting a certain approach to nutrition, a study may be funded that is already biased to produce results favorable to that company or lobby. This is the ugly side of nutrition research that most of us would prefer not to think about, but it does not hurt to be aware, when a new finding favoring a certain food category comes out, of where funding for the study came from. Of course, this is not to say that all studies funded by special interests are flawed, but it pays to consider all aspects when deciding what you will believe. Finally, it is difficult, even with good scientific research, to make a blanket statement about eating healthy that applies to every human being on the planet, because we are all unique and individual with varying genetics, environment and access to the food supply. Having said that, there are still some basic nutrition principles that apply, in a general sense, to everyone. Please feel free to use this information in a way that gives you the most benefit! There are six nutrition categories that we need to consider when looking at a healthy lifestyle. Each of these categories has a unique and important role to play in your total health. It is important that you eat a variety of foods so that it is more likely that all of these nutrition categories will be represented. If you eat the same food day after day, you may be missing out on essential nutrients. It is also important to remember that one nutrition category is not more necessary than another, since they all work together to keep you healthy. The first three categories—Protein, Carbohydrates and Fats—provide energy to your body. Another way of saying this is that they have calories! In fact Protein and Carbohydrates provide 4 calories per gram, and Fats provide 9 calories per gram. In this age of calorie counting and ultra-thin role models, calorie has become a dirty word, but it does not take a rocket scientist to figure out that we do need energy (another word for calories) to live, so eating these three, in moderate and proportionate amounts, is a good thing. In addition, each of these three nutrients has other important functions in the body, including providing the necessary materials for making the body's tissues. The last three categories—Vitamins, Minerals and Water—do not provide any calories. That means when you take your multi-vitamin and mineral tablet and wash it down with water, you have not added in any significant way to your calorie total for the day. Although these nutrients do not provide energy, they are involved in most of the processes going on in your body every moment of every day. A long term deficiency in any one of them would have an effect on your overall health and how you feel. Please click on the individual nutrient links for more specific information. There is one important dietary substance that is not usually listed in healthy eating nutrition guides as a separate nutrient, but in recent years, it has taken on the same importance, in its own right, as the other nutrients. That substance is Fiber. With the change in the food supply, to more processed food, the need for a sufficient amount of fiber in the diet has become a critical issue. A lack of fiber in the diet has been associated with a rise in colon cancer and other digestive disorders. There is a lot of literature about the requirements for these nutrients. For the reasons stated above, these recommendations are at best, general guidelines for individuals, since they are based on averages, and can only marginally take into account the differences in people. The Food Guide Pyramid is a visual representation of the five food groups and the proportional amounts of each that we should eat on a daily basis. The broad base of the pyramid is made up of the Bread, Cereal, Rice and Pasta Group, the group from which, according to this theory, we should get the most servings, while the tip of the pyramid is the Fats, Oils and Sweets Group, from which we should get the least servings. 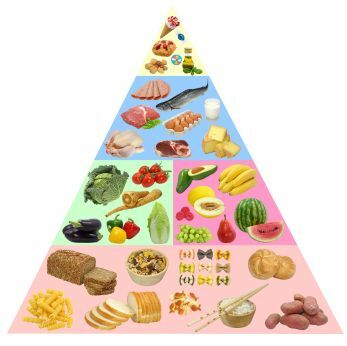 The Dairy, Protein and Fruit and Vegetable Groups show up in the middle of the pyramid. The idea of the Food Guide Pyramid is for you to be able to see a picture of how you are eating. Without being too precise, if you are generally eating more grains (especially whole grains) and fruits and vegetables than you are the other foods, and if you are limiting your intake of fats and added sugar, you are probably doing okay. Another version of the pyramid, designed by the USDA, divides food into Grains, Vegetables, Fruits, Dairy, Meat/Beans and Oils. In this depiction, the pyramid is divided vertically into these six groups with Grains taking the largest slice, followed by Vegetables, Dairy, and Fruits, then by Meat/Beans, with a small sliver designated for Oils. Interesting Fact for Healthy Eating Nutrition: After twenty years, the USDA has changed their visual representation for eating healthy from a pyramid to a simpler concept called "MyPlate." This newer model shows a dinner plate divided into four portions for Protein, Vegetables, Fruits and Grains, with a side of Dairy. Unfortunately, for many of us, our food pyramid is top-heavy. This means that we are getting many or most of our calories from fats and sweets, which has contributed to the rise of obesity and adult-onset (Type II) diabetes in this country. It also may have contributed to the increase in heart disease and some forms of cancer. Fortunately, we can reverse this trend by simply being more aware of what we eat. The RDA stands for the Recommended Dietary Allowance and is an average daily requirement for specific nutrients. It is divided according to gender and age, with special categories for pregnant women and nursing moms. Another way to discuss nutrition requirements with regard to the first three nutrition categories, is the 30-30-40 rule. This says that you should get approximately 30% of your calories from Protein, 30% from Fats and 40% from Carbohydrates. These percentages vary somewhat, depending on the source, but the idea generally is to eat a balance of the three with a higher percentage from the Carbohydrates category. During the Low-fat Diet craze that hit in the 1980’s, the recommendation was somewhat skewed against fats, dropping them to 20% or even 10% of the diet. Conversely, the advent of the Low-carb Diets, dropped the percentage of carbohydrates in favor of protein and fat. Common sense tells us that a more balanced approach, where none of these important nutrient categories is severely restricted, is probably the most beneficial in the long run. -to limit foods that have no real nutritional value. It is my hope that in the pursuit of good nutrition and a healthy eating lifestyle, you will discover some new and delicious foods that will enhance your meals and give you the energy and wellness to live the life you want. 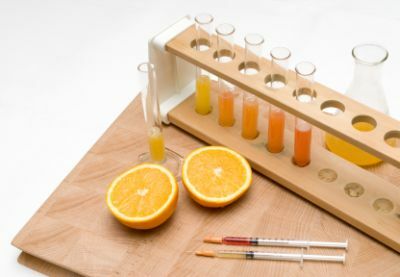 Test your basic knowledge of healthy eating nutrition - nutrition. Click on the link below. Click on this link to go from Healthy Eating Nutrition page to Healthy Eating Guidelines page.